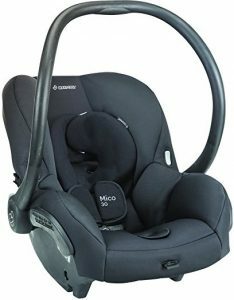 We can find Maxi-Cosi Mico AP and Mico 30 as two options that We can consider if We are looking for infant car seat for our child. As two variants of Maxi-Cosi Mico infant car seat, We can find that there are several similarities between maxi-Cosi Mico AP and Mico 30. There are also few differences between them. Which of them is the one that We should choose? In this article We will talk about the differences of Maxi-Cosi Mico AP and Mico 30 to help you decide which of those two infant car seat is the one that you should choose. What You Should Know about Maxi-Cosi Mico AP? Maxi-Cosi Mico AP is one of the lightest infant car seat that We can find in the market. Maxi-Cosi Mico AP is introduced as infant car seat for 5-22 pounds baby in rear-facing mode only. Maxi-Cosi AP comes with Air Protect Superior Side Impact Protection that provides more protection on the baby’s head area. Maxi-Cosi Mico AP also comes with stay-in-car adjustable base that completed with latch system for better fit in your vehicle’s seat. Maxi-Cosi AP is also completed with Cozi-Dozi infant insert that provides support for smaller babies. Maxi-Cosi Mico AP also comes with self-wicking fabric that deodorizes and draws liquid away from the skin to help keep the baby dry and comfortable. Maxi-Cosi Mico AP is also completed with flip-out visor on Canopy that helps protect the baby’s eyes from bright lights as their eyes are still sensitive. Maxi-Cosi Mico AP also comes with easy to remove fabrics that’s also machine washable. So it’s easy to keep this infant car seat clean when It gets dirty. What You Should Know about Maxi-Cosi Mico 30? Maxi-Cosi Mico 30 is also another lightest infant car seat that We can find in the market. Maxi-Cosi Mico 30 is recommended to be used in rear-facing mode for 5-30 pounds baby. 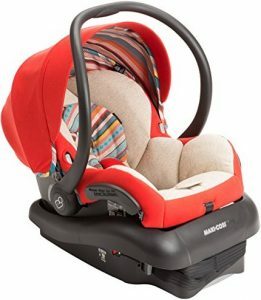 Maxi-Cosi Mico 30 comes with stay-in-car adjustable base. We can also find cozi-dozy infant support for smaller babies. Maxi-Cosi Mico 30 is also completed with side impact protection and use self-wicking fabric. Self-wicking fabric is able to deodorizes and draw liquids away from the skin to keep the baby dry and comfortable. Maxi-Cosi Mico 30 comes with one-click Latch system that make installation easy but secure. You can also install Maxi-Cosi 30 without the base that make it perfect for city trips in a cab. We can also use Maxi-Cosi 30 as a travel system with Maxi-Cosi and Quinny strollers using the car seat adapters. We can also find multi-position sun canopy that completed with flip-out visor that provides protection for baby’s sensitive eyes. Maxi-Cosi Mico 30 comes with easy to remove seat pad that doesn’t require rethreading of harnesses. The car seat pad is also machine washable that make it easy to clean the car seat when It gets dirty. The specs and features of Maxi-Cosi Mico AP and Maxi-Cosi Mico 30 can be found on the table below. We need to know the key specs and features of those two infant car seats before We can talk more about their differences. Let’s take a look at their key specs and features together. What are the Differences between Maxi-Cosi Mico AP and Maxi-Cosi Mico 30? We can find that there are few differences of Maxi-Cosi Mico AP and Maxi-Cosi Mico 30 after We look at the the table above. Do you want to talk more about those differences? Let’s talk more about those differences together. Both of Maxi-Cosi Mico AP and Maxi-Cosi Mico 30 come with side impact protection. But Maxi-Cosi Mico AP comes with more advanced Air Protect side impact protection. Air Protect superior side impact protection is additional cushion system that give extra protection on the baby’s head as It’s needed most. Maxi-Cosi 30 only comes with more standard side impact protection. The recommended weight limit of Maxi-Cosi Mico AP and Maxi-Cosi Mico 30 are different. Maxi-Cosi Mico AP is only recommended to be used for 5-22 pounds infant, while Maxi-Cosi Mico 30 is recommended to be used for 5-30 pounds infant. So you can use Maxi-Cosi Mico 30 longer before your child shift to the next car seat. Which of Them is the One that We Should Choose? Share the post "Maxi-Cosi Mico AP vs Mico 30 Review"
Two of the choices that you can consider if you are..